Do you ever feel so conflicted, like how could something feel so right yet be so wrong? Or was it, be so wrong but feel so right? Uhm…let me start over. You know the rule of eating fried food right? You eat it as soon as it comes out of the fryer, as soon as you can take the heat. Thin and crispy French Fries are one of my favorite things on Earth! Yet, ten minute old fries, I don’t want it, not even in a doggie bag. Hot Tonkatsu – hip! Cold Tonkatsu – poor college student food. Fresh, hot, crispy bottomed Potstickers = dangerous stuff your face food. Cold Potstickers = hang-over breakfast. You got the point. 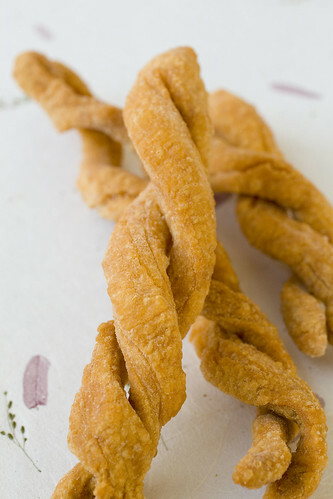 Well, Dza Ma Hwa (let’s call them Chinese Breadstick Twists) are deep-fried, but don’t even think of eating them while they’re hot. They’re no good. You have to wait till they cool completely, for hours! Doesn’t that make your brain twist and turn? Then, the Chinese Breadsticks break another cardinal rule. I was taught not to fry things at a low temperature (with the exception of blanching and then finishing at a higher temperature). It’s usually a sure way to get an oily and greasy tasting product. But, these babies, you’ve gotta fry them at a low enough temperature to fry them for 15 minutes without burning. We even did a little experiment, with frying at different temperatures/times. The 3 minute ones were the worst, like stale bread. The 15 minute fryers have a great snap and are not oily at all. When you get them right, each bite releases a loud crunch. They’re incredibly addictive, but you won’t be able to hide them since everyone will hear you eating them. 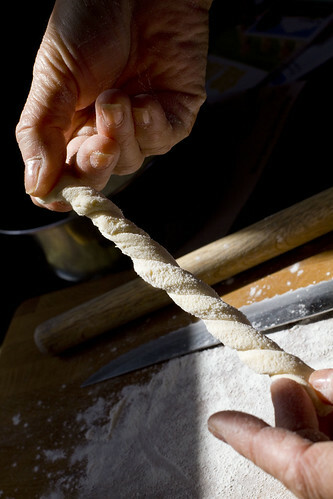 They’re similar to breadsticks, and just mildly sweet, though you can add powdered sugar if you want sweeter ones. I hope you enjoy one of my childhood favorites! 1. In a medium bowl, stir together flour, sugar, and salt. Stir in egg and add water in 3 additions, stirring in between each addition. 2. Knead in the bowl for a few minutes. It will be lumpy but should not get stuck to your hands. You can add a little flour if needed to get it to form a ball. Coat the ball with a little flour and return to the bowl. Cover with a wet towel and rest for 2 to 4 hours. 3. Uncover dough and knead until smooth, about 2 minutes. Return to the bowl, cover with wet towel and rest for another 10 minutes. 4. Heat the oil for frying to a lower temperature, about 280 degrees F.
5. Use half the dough first. (Keep the other half under the towel in the bowl.) Pat it into an oval on a well-floured surface. Roll to 1/2″ thick. Cut 1/2″ strips. For shorter pieces, you can twist two strands together. 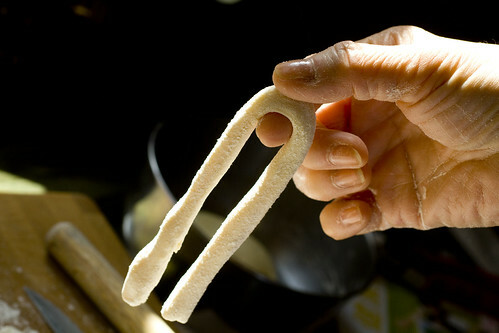 For longer pieces, you can fold in half, holding the midpoint in one hand and the two ends in the other, then twist. Repeat until you have used up all the dough. 6. The amount you fry in each batch depends on your pot size and amount of oil. Don’t crowd too much. Fry for 15 minutes, turning once in a while. They should be golden, but not burnt and not too dark. 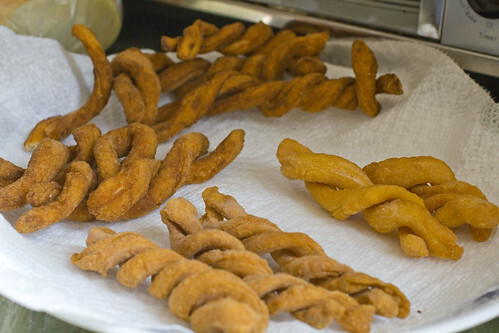 Tip for frying: Sometimes the twists will want to come apart. 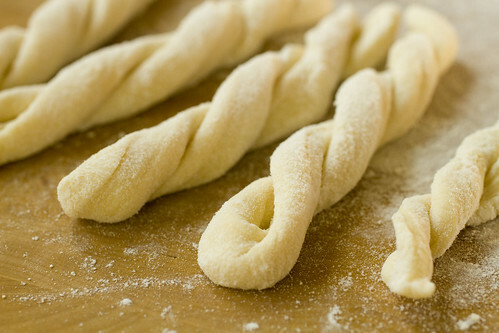 Hold the two ends of the dough twists and dip the center into the oil for a few seconds first, then release into the oil completely. This will help keep twists together. 7. 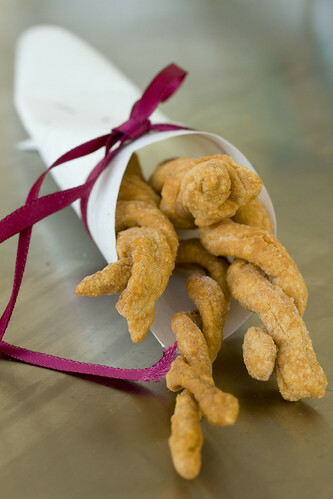 Drain on paper towels (and toss in confectioner’s sugar if you want sweeter twists). Allow them to cool completely on wire racks, about 3 hours. posted by jessica	at 09:16 AM	Filed under Chinese, Recipes. You can follow any responses to this entry through the RSS 2.0 feed. Both comments and pings are currently closed. making your own ma-hwa? wowowowowow. that is my favorite guilty pleasure snack when I find myself in a chinese supermarket snack aisle. and, get fancy with the black sesame seeds and other add-ons! Nice! I see these all the time in Chinese bakeries, but too much for one to consume. Fried dough is a weakness of mine. . .Looks oh so good! avisualperson, I don’t think I’ve ever tried the chiao-guo…I’ll have to keep an eye out next time I’m in a Chinese bakery. 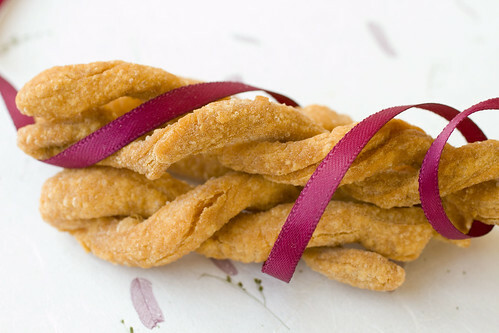 Grace, the texture is very different from churros and mush closer to breadsticks. But, you can definitely add cinnamon sugar to it! That breadsticks looks so crunchy. Great with coffee or tea. 🙂 Thanks! Oh man, I’m reliving my childhood one food at a time with these recent posts of yours. AND I’M LOVING IT :). Never thought about making these, or that they’d be so simple (other than my fear of deep-frying that I’d best conquer soon).